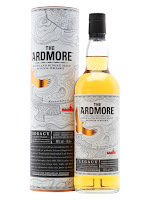 This is the replacement of the Ardmore Traditional. It is a mix of 80 % peated casks and 20 % unpeated casks. I get marzipan sweetness and light peat in the smell. Seems very young, and not much influence from the wood. Actually almost nothing. Very gentle on the nose, and a bit boring to be honest. Not much power in the taste. Very gentle on the palate as well. The taste reminds me a lot about the smell. Light marzipan sweetness, vanilla and some light peat. Nothing really changes in the finish, but at least it stays for a while considering the mellow taste and low ABV. Ardmore went from Traditional to Legacy. From good to boring. From quality to capitalism. Another boring NAS whisky… As you might figure I am not a fan of this Legacy, and it is quite sad because I normally love the peated Ardmores. I will give this 78/100 (19/20/20/19).